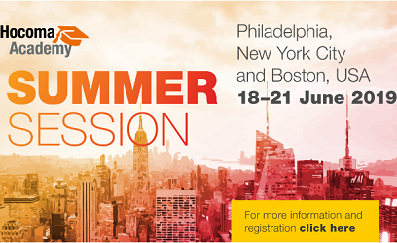 Join Hocoma in Philadelphia, New York City and Boston for the Hocoma Academy Summer Session, 18 – 21 June 2019. Read more and register on Hocoma’s website. You’ll have the chance to visit hospitals that have successfully implemented advanced technologies in the USA. Throughout the session you will learn how to optimise therapy at your facility, network with experts and opinion leaders, get insights from Hocoma’s selected panel of speakers, and visit New York, Boston and Philadelphia. Dr Paolo Bonato – Director of the Motion Analysis Laboratory at Spaulding Rehabilitation Hospital (Boston). Associate Professor in the Department of Physical Medicine and Rehabilitation. More speakers will be announced in due course. Hocoma has selected four of their most successful US clinical partners to give you the change to visit and learn from their best practises. The largest medical rehabilitation provider in the Philadelphia region, MossRehab, offers a complete continuum of care for persons with traumatic brain injury, spinal cord injury, amputation, stroke and other neurological and musculoskeletal diagnoses through use of assistive technologies and specialised programs with several inpatient and outpatient locations in Pennsylvania, New Jersey and Delaware. Tickets cost CHF 2500 per person, including accommodation, lunches, social events and travel in between sites. If you are also attending RehabWeek Toronto 2019, Hocoma is pleased to offer you a 20% discount on the Summer Session 2019 price. Mention that you are a RehabWeek attendee when registering for the Summer Session, and send Hocoma a copy of the RehabWeek registration confirmation. The Summer Session has a limited number of spaces so make sure you register as soon as possible. Please do not book flights or other arrangements until you receive a written confirmation and invoice on 4th April 2019. Read more and register on Hocoma’s website.